Summer in San Diego is still hot, and so is this month’s Balboa Park Explorer Experience. The Old Globe Theater is offering Explorer passholders a free behind-the scenes tour on Sunday, August 20, 2017. Summer in San Diego is still hot, and so is this month’s Balboa Park Explorer Experience. The Old Globe Theater is offering Explorer passholders a free behind-the scenes tour on Sunday, August 20, 2017. Learn how the theater’s spectacular costumes are built and how the Scene Shop creates such fantastic sets. See statues, puppets and elaborate, fanciful headgear created by the Properties Department. In addition, learn something informative about each of the current plays running, whether it’s a well-loved classic, a contemporary Tony Award-winning play, or an exciting new musical. 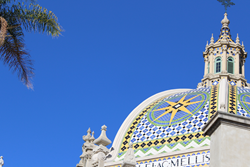 Since 2014 the Explorer Pass has provided passholders the opportunity to explore the rich cultural and artistic offerings of Balboa Park in an easy and affordable way. Not only is an Explorer Pass the best money-saving option for enjoying all the Park has to offer, passholders enjoy exclusive access and events each month, such as unique behind-the-scenes tours, early entry into special museum exhibitions, free admission to Maker Faire San Diego, and much more.